Communication is an important aspect of a successful job and our clients interact directly with our project surveyors. 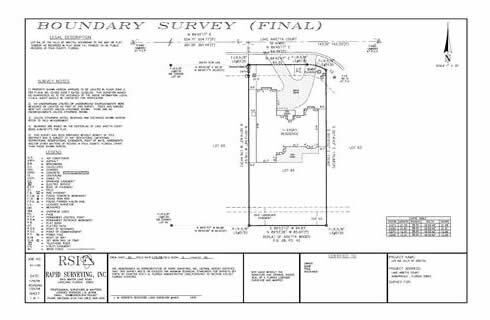 This type of boundary survey is usually preceded by a foundation survey. The survey is performed after construction on the site is completed. It will reflect the visible improvements made during the construction process. As stated in the foundation survey, Rapid Surveying understands project schedules. We therefore request that the client notify us immediately upon their knowledge of needing the final survey. Many times the owner/contractor does not inform us that a final survey will be required leaving us with a stressed schedule.